Citigroup's fourth quarter earnings fell short of Wall Street's expectations as the bank's legal expenses rose and it released less money from its loan-loss reserves. The bank, based in New York, said a big chunk of the legal expenses came from a settlement reached last week over illegal foreclosure practices in the aftermath of the housing bust. It was Citigroup's first quarter under the leadership of CEO Michael Corbat, who took the helm after former CEO Vikram Pandit resigned abruptly in October. "We recognize that our net income today doesn't yet reflect the amount or caliber of earnings that our shareholders expect and our franchise is capable of," Corbat said on a conference call with analysts to discuss the results. Corbat's first bold move was a decision, announced in December, to cut 11,000 jobs, close dozens of branches and trim its consumer banking business in some countries. More than half of the job cuts were to come from the company's consumer banking unit. Citigroup took a previously announced charge of $1 billion in the quarter related to that "repositioning" process. The bank has cut 7,000 jobs since the year-ago quarter, about 3 percent in its overall work force. Since the previous quarter, 3,000 jobs were eliminated. Citigroup now employs 259,000 people. 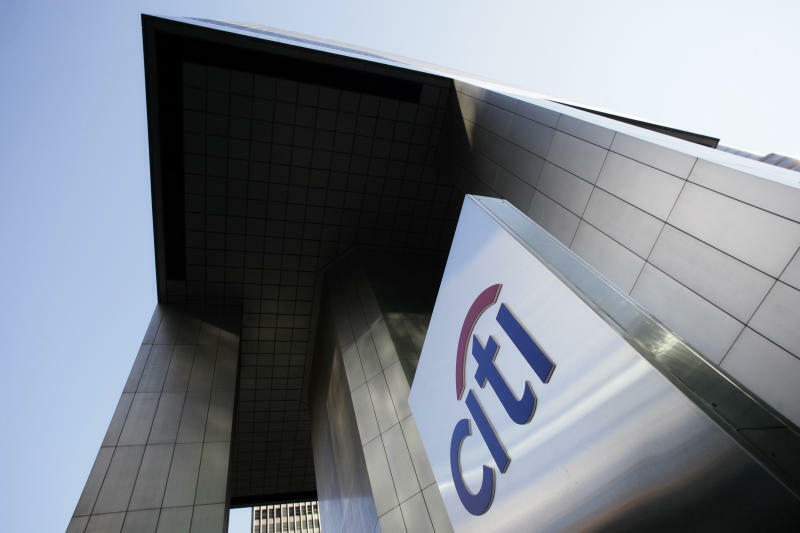 Citi earned $1.16 billion after paying preferred dividends, or 38 cents per share, in the three months ended Dec. 31. That compares with $933 million, or 31 cents per share, in the same period a year earlier. Excluding one-time costs related to restructuring and accounting for outstanding debt, the bank earned 69 cents per share. That's well below the 97 cents per share analysts polled by FactSet were expecting. Citigroup's Latin American and Asian operations, a traditional source of strength for the bank, helped drive the earnings growth. Net income from both regions rose 16 percent over fourth quarter of 2011. In Europe, the Middle East and Africa, net income fell 6 percent from the previous year. Revenue rose to $18.7 billion, up 8 percent from the same period a year earlier and slightly below forecasts. Citi's net interest revenue, which includes interest collected on loans and interest paid out to depositors, edged up to $12.15 billion from $12.08 billion a year earlier. Banks' interest income has been squeezed by ultra-low interest rates and competition for depositors. They are increasingly reliant on fee-based services like investment management and advisory offerings. The bank's non-interest revenue, which includes fees and other categories, rose 18 percent, to $6.02 billion from $5.09 billion. Citigroup reported $1.3 billion in legal and related expenses in the quarter. A big part of the legal expense was a settlement with federal regulators announced last week related to Citigroup's foreclosure practices. The bank allegedly took part in industry-wide practices that caused people to be foreclosed on illegally. It took a charge of $305 million in the quarter to cover its agreement with the Office of the Comptroller of the Currency and the Federal Reserve. The higher legal expenses also included various expected costs related to its U.S. consumer business, which bank officials would not specify. Citigroup also released less money from its rainy-day fund to cover souring loans — $86 million, compared with $1.47 billion a year earlier. In a departure from an industry-wide trend, Citi said it originated fewer mortgages than in the year-ago quarter: $16.8 billion, down from $21.1 billion. Mortgage originations increased at the nation's other top banks, including JPMorgan Chase, Wells Fargo and Bank of America. Citi's stock fell $1.24, or 2.9 percent, to close at $41.24 Thursday. Daniel Wagner can be reached at www.twitter.com/wagnerreports .